Artist’s depiction of Mnyamawamtuka in its natural setting. The name of this new titanosaur—Mnyamawamtuka moyowamkia, pronounced “Mm-nya-ma-wah-mm-too-ka mm-oh-yo-wa-mm-key-ah”—means “animal of the Mtuka with a heart-shaped tail” in Swahili, with the Mutka being a dried-up river bed near the cliff along the East African Rift System in southwestern Tanzania where the 100-million-year-old fossilized bones were recovered. And as its name also implies, this Cretaceous creature had a strange heart-shaped tailbone, the function of which isn’t immediately clear to paleontologists. Mnyamawamtuka was discovered in 2004, and it took four years for field paleontologists to complete the required excavation work. Recovered body parts included the backbones, shoulder, and legs, along with remnants of its neck, hip, tail, and arm. Sadly, its skull could not be found. Enough pieces were recovered, however, to allow Eric Gorscak from Midwestern University and Patrick O’Connor from Ohio University to conduct an analysis and compare the dinosaur to similar specimens. Details of their findings were published today in PLoS ONE, 15 years after the fossils were first discovered. The team at work along the cliff wall in 2007, at the East African Rift System in Tanzania. Other important dinosaur discoveries also impeded a timely analysis, including studies of Rukwatitan and Shingopana, two other titanosaurs found in Tanzania. Given the workload, Gorscak and O’Connor had to plan out their priorities for their research focus. Illustration of the recovered bones, including the heart-shaped tailbones. The recovered Mnyamawamtuka skeleton belonged to a relatively small titanosaur individual, likely a juvenile that wasn’t yet fully grown. An average person is roughly the height of its hind legs, and it weighed about a ton. The full size of a grown Mnyamawamtuka could not be derived from this skeleton. Features distinct to Mnyamawamtuka include a small sternal plate (chest bone), and a curious jumble of traits seen in both earlier and later titanosaur species, including different styles of teeth. 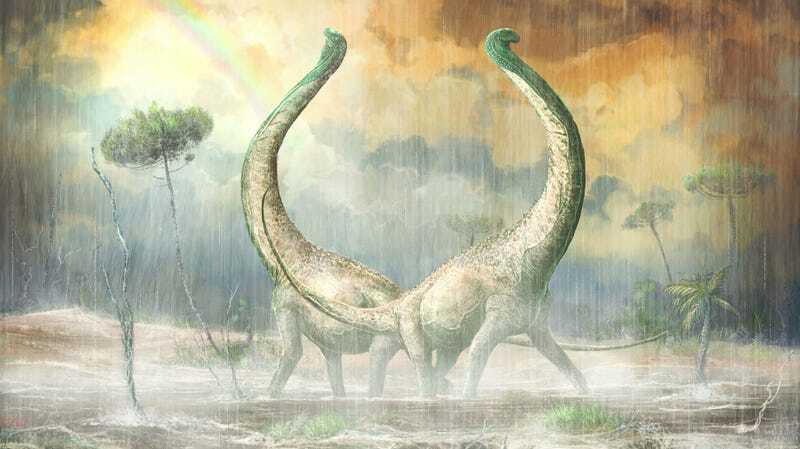 And as noted, this oversized sauropod had a heart-shaped tailbone, comprised of two tail vertebrae with conspicuous extensions on the centrum (the central part of the vertebrae). Other closely related titanosaurs, including Malawisaurus from nearby Malawi, is also known to have these expansions, but to a smaller degree, said Gorscak. Mnyamawamtuka lived along a floodplain or river delta that experienced wet and dry seasons, according to the associated geological research. Animals that lived alongside it included other four-legged, long-necked sauropods, carnivorous theropod dinosaurs, turtles, and relatives of today’s crocodiles. Titanosaurs are typically associated with fossils found in South America, but as this discovery and others are starting to show, the African landscape was an important part of their story as well. Stephen Poropat, a paleontologist from Swinburne University of Technology in Melbourne, Australia who wasn’t involved in the new work, said the importance of the Mnyamawamtuka specimen lies in its completeness, coupled with its age and geographic location. “Having so many bones, representing most parts of the body, from a single individual is remarkable,” Poropat told Gizmodo. “This means that Mnyamawamtuka will probably prove to be one of the most important African titanosaurs discovered to date, since it might help us to understand where it and other African titanosaurs fit on the titanosaur family tree. Indeed, this discovery, along with those in the future, will help scientists to better understand how these impressive animals evolved in response to perpetually changing environments—and why size apparently really, really mattered.